With abundant wood trim, expansive sunroof, and powerful 4-valve-per-cylinder engine, the new E-Class offers an unrivaled combination of performance and luxury. The 10th generation E-Class takes on a new shape that’s roomier inside, sleeker outside and stronger all over. Our commitment to keep our executive fleet current with best vehicle safety features on the market is clearly evident in our new 2017 E-class. Book a ride today! Since the 1970s, the Mercedes-Benz S-Class has represented the pinnacle of automotive excellence and a benchmark for the rest of the automotive landscape. One could even argue that Mercedes has led the way from the very beginning, when company founder Karl Benz invented the car. Today, the Mercedes-Benz S-Class sedan is every bit the benchmark that their illustrious forebears were, boasting an unparalleled blend of engineering, technology and luxury that permeates everything from the suspension to the stereo. This is a car that can essentially drive itself in stop-and-go traffic while giving you a hot stone massage and automatically adjusting the suspension to counteract bumps in the road before you drive over them. There are only a handful of new Mercedes S Class sedans in Colorado and Eight Black is proud to include this amazing vehicle in its capable fleet. Mobility Vehicle – Mercedes Metris – Seats 4 plus 1 Wheelchair passenger, or 6 passengers in standard van configuration. 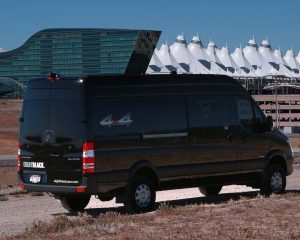 We are the only operator in Colorado to have the brand new Mercedes Metris WAV – Wheelchair Accessible Vehicle. With its Easy Flex fold flat ramp, and 4 additional seats, its easy to see why the Metris is the most luxurious, comfortable and above all, safest mobility vehicle on the market. Add the Eight Black philosophy to the Metris and you have the complete package. **For our clients safety, ALL our vehicles are fitted with GPS and Onboard Cameras – which are constantly relaying information to our 24/7 Dispatch. Cameras record both internally and externally on a continual loop. Our GPS system ensures that our staff know where our vehicles are at any given point in time. Need something that holds 30 people or more? Call our 24-hour car service hotline at (720) 316-6822 for a quote or request more information online.